Four fire crews were called to a large tyre fire at an industrial building in Neath Port Talbot on Wednesday morning. Mid and West Wales Fire and Rescue Service crews from Port Talbot, Morriston and Swansea Central were sent to Briton Ferry after getting calls about a building fire. Black smoke was visable for several miles and people were told to keep their doors and windows closed. 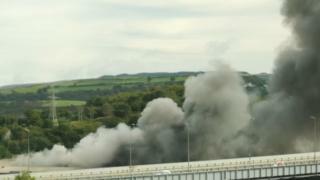 The fire started just before 11:00 BST at a building near the old Wern Works. A spokeswoman for the fire service confirmed that the crews started to leave the scene at about 12:45.